We, at Art of the Home, believe that everyone is a designer at heart! That’s because a truly inspirational design is born from life experience, love and the internal compass that tells you “yes, I feel good in here.” We all have it. What can happen is that not everyone has the time (and it does take time…) to nurture their interior design garden so to speak. You may have other priorities. You may be on a different timetable, or you enjoy cultivating other interests. Whatever the reason, that’s where a professional interior designer can come in handy and speed up the interior design process. Through asking targeted questions, checking photo examples of what you love and simply talking to you to find out who you are (e.g. what brings you joy, helps you relax and makes you glow), a talented designer will use their designer toolkit and customize a master bedroom that’s the right fit for you. So whether you are planning to hire an interior designer to bring some joy into your master bedroom or simply want to share design ideas with your significant other and friends, one of the first steps is to gather photos that “wow” you. And don’t cut your dreams short! Sure, you may not be at a place where you can afford the dream bedroom you’ve seen in your favorite magazine, or right here at Art of the Home, but it’s important to include everything that resonates with you in your dream portfolio — it will inform your interior designer as to what you are looking for and then allow them to make helpful recommendations based on your current home and budget. It’s also very neat to see how one’s dream evolves over the years…such fun! 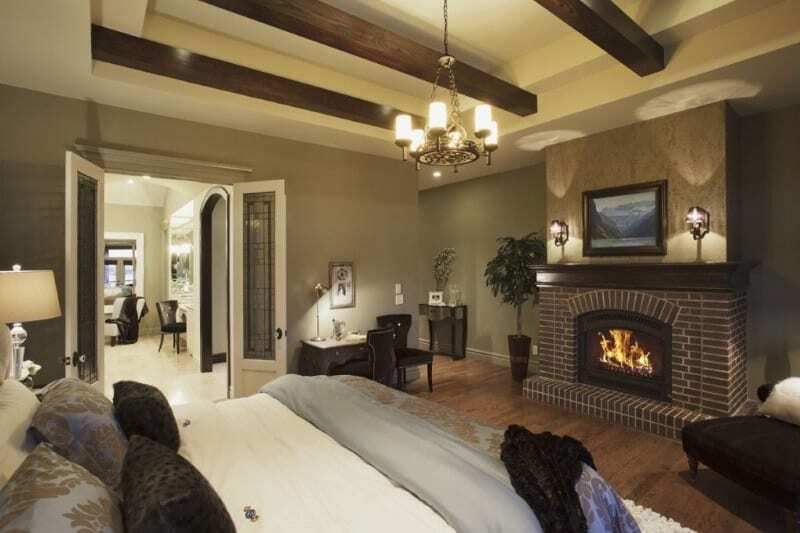 So take a look at what some professionals did in our gallery below of amazing master bedrooms decorated by professionals. And if you want to hire a designer, leave the guilt at the door, it has nothing to do with you not having a good eye, you may just be choosing to use your time elsewhere, and that’s totally ok…good for you! Of course, if you want to start your own designer journey, go for it. Home design is not reserved to interior designers. We all get to play if we want to…it’s free and can be so uplifting. Hope you enjoy the photos and beautiful day to you! The Little Plus: the brick cast iron fire insert with its matching sconces above the mantel. Love the French Provencial writing desk. 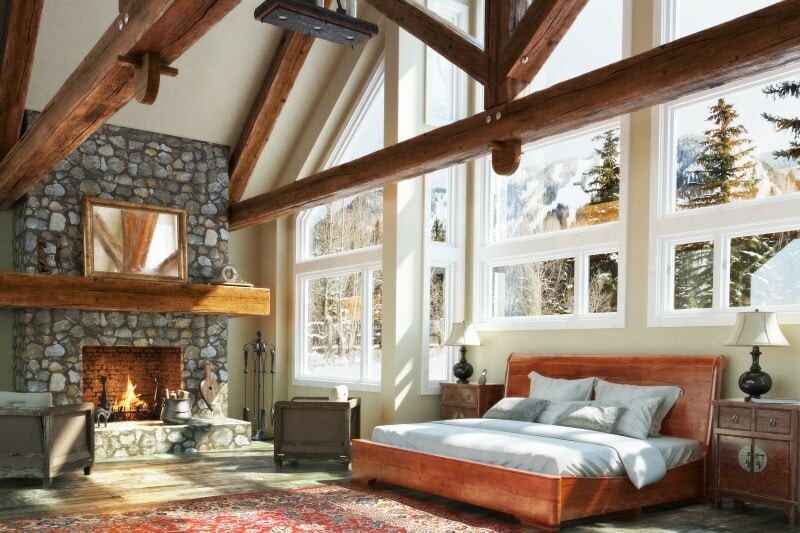 And the exposed ceiling beams with the hanging chandelier add just the right amount of rustic feel to this cozy room. The Little Plus: the dark accent wall calls back the metal frame of the full view wall windows. 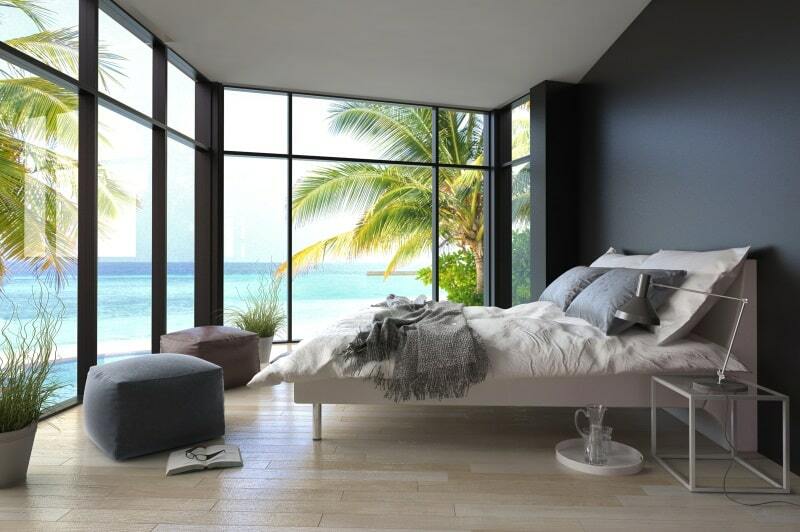 With this view, the designer opted for a minimalist modern design to give this ocean view the honor it deserves. Also, note the whitewashed hardwood floors that soften up the look and call back the sand color of the beach. Vacation feeling guaranteed every day! The Little Plus: the engraved stone fireplace carved up the tall ceiling is magnificent! And, you can feel how the simplicity of the furniture and the neutral tone of the color palette are just the right choice to showcase the antique terracotta hexagonal tomette. Oh, and did I mention the exquisite vintage candle chandelier, so romantic, wow, just wow! The Little Plus: the dark brown wood accent wall makes the headboard seem larger. You can see how the designer cleverly added spotlights on the artwork to set the mood in the room — what a fantastic idea! Finally, note the rug design and color palette which were both chosen to soften up the room and add a gentle feminine touch. The Little Plus: the stone-faced fireplace and the cathedral ceiling with exposed rustic beams — wow! The showering of natural daylight thru the wall windows illuminates the room without compromising on privacy too much. The Little Plus: the in-swing French patio doors that with a 360-degree opening so you can fully enjoy the view…and the fresh air! Also, how rich is the assortment of frames and mirrors on the wall — totally lives up to the richness and warmth of the room. And notice how a rustic desk doubles up as a nightstand — perfect to share your daily discoveries and all that is to be grateful for in your journal. The Little Plus: the three-panel door armoire in a Louis-Philippe style is so beautiful. 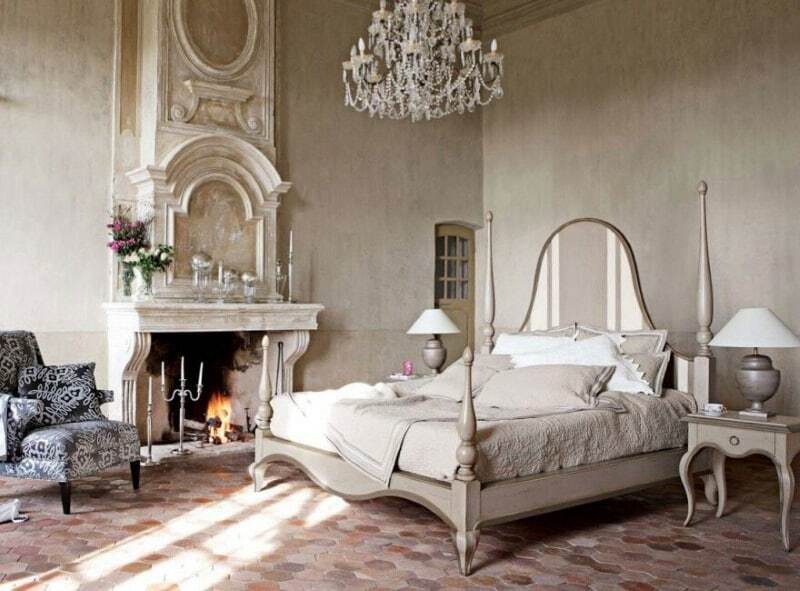 The iron bed with pale yellow tufted headboard adds a feminine touch of luxury. And note the elegant simple night stands with cabriole legs — not too overwhelming and just enough to store the essentials with style.